After living in North America for almost a quarter of a century, I have finally decided to make a true confession. I don't really like turkey. This is not a big problem or anything, but at Thanksgiving and Christmas time, I surreptitiously avoid my friends, colleagues, and others lest they ask me about the festive meal, one in which the stuffed gobbler and other accompaniments are the norm. The week following Thanksgiving is especially tricky because most staff-room conversations revolve around the topic of the umpteen different ways of fixing left-over turkey and stuffing. Through all these conversations, I play dumb and shrug. Worse still, sometimes I resort to doing the tricky thing of saying that I don't have any left-over big-bird, stuffing or giblets. Normally, people leave me alone after such an admission because they assume that the three voracious males and the inane cat in my household must have gobbled up the roasted bird along with the spare parts and innards. Still, I dread any direct questions. Did you all really finish everything? Not even the tough gizzard is left over? And so on. So, this Thanksgiving, as a way of thanking my stars for having been able to avoid admitting the truth about this festive bird, I decided to come clean and get things off my chest. In a word, I don't like turkey. That said and done, I must also talk about my amazing luck. You see, I married a bonafide American some two and a half eons ago and we have lived all of our married life in North America, i. e. on his turf. You would think that my turkey dislike would have created insurmountable problems at holiday seasons. This has not been the case. By an incredible coincidence, he also doesn't care for turkey and his parents had long repudiated this true North American festive staple much before I became a part of their family. So, while we have many difficulties, the blessed gobbler is not one of them. So, what exactly do we make for our Thanksgiving meal? We have a leg of New Zealand lamb. Along with the lamb, I roast sweet potatoes, squash, regular potatoes, broccoli and red peppers. And my significant other, Tim, makes an apple pie, his speciality. So, you see, in many ways, we are truly a North American family at Thanksgiving time. I should tell you about how Tim makes pies, especially the pie crust. When it comes to pie crust, Tim is an ultra purist. Not for him are the ready-made, packaged, or frozen pie shells. Everything has to be made from scratch, observing all laws of pie-crust making. So, while the lamb is roasting in the oven, the kids and the feline are walking around like hungry lions on the African Savannah, smelling the lamb, he starts his crust. He measures out the flour and works in the fat, taking care not to knead the flour because any kind of handling the dough is an anathema to pie-crust making. Since this process involves infinite patience of which he has but a miniscule amount, the air is rife with all sorts of unprintable words. It is a normal festive occasion for us. Then comes the assiduous process of rolling out the pie shells. Since Tim doesn't knead the dough at all, rolling out pie shells is a complicated process which involves rolling and surgically attaching the pieces which tear off, all the while wiping the profusion of sweat that forms on his brow. Now we have the rolled out pie shells, the process of peeling and slicing apples starts. All apples are peeled and cored and cut into half-moon-shaped slices. Then, Tim arranges them painstakingly so that all slices nestle into one another with the convex side of every slice fitting snugly into the concave edge of the slice behind it. After this, he adds sugar and cinnamon, covers the apples with the top pie shell and slides the pies into the oven. If he is making a blueberry pie, the process is even more complicated! 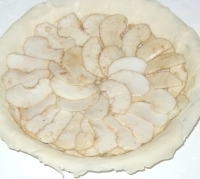 After the bottom pie shell is ready, he arranges each blueberry in such a way that its distal end points up. Sometimes I ask him, "what's the point? All berries will collapse while baking and form a big mush. Who can tell how they were arranged?" But Tim is a firm believer in "the method" and all comments and questions are dismissed as flippant. This year, finally, he acquiesced to ma Lenore's exhortations and used a food processor for making the pie dough. The cuisine art blender did the whole job in a few seconds with nary a swear word. So, the process has been modernized a bit this year. mmmmmmm... the lamb was delicious, the sweet potatoes and vegetables divine, but the pie was only so so. I am afraid that unless Lenore gives us some pointers about using the cuisine art for making pie dough, we will be back to Tim's method of making the pie dough.